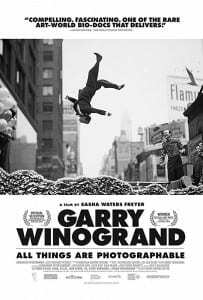 “What is a photograph?” Garry Winogrand (1928-1984) asks in his iconic, gravelly Bronx accent. Decades before digital technology transformed how we make and see pictures,Winogrand made hundreds of thousands of them with his 35mm Leica, creating an encyclopedic portrait of America from the late 1950s to the early 1980s in the process. When he died suddenly at age 56, Winogrand left behind more than 10,000 rolls of film – more than a quarter of a million pictures! These images capture a bygone era: the New York of Mad Men and the early years of the Women’s Movement, the birth of American suburbs, and the glamour and alienation of Hollywood. He produced so many unseen images that it has taken until now for the full measure of his artistic legacy to emerge. Forged by Winogrand’s own words and images, GARRY WINOGRAND: ALL THINGS ARE PHOTOGRAPHABLE is a stunningly intimate portrait of an artist who both personified his era and transformed it.